There were a lot of must have games released for the Nintendo Entertainment System, and a lot of them were overlooked. 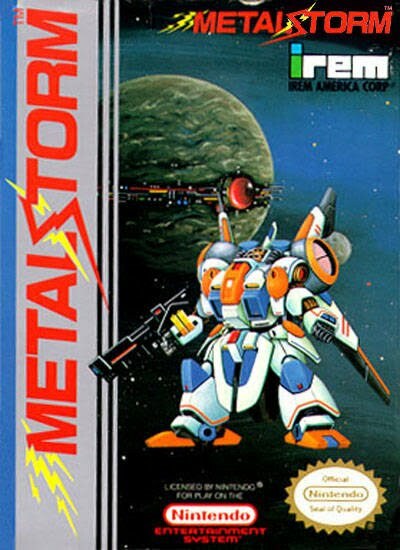 one of those gems was a rather innovative action game from Irem called MetalStorm. What made Metal Storm cool was that it was the first game that gave a player control of the gravity around them. That, my friends, means that you can walk on ceilings, jump towards the floor, and "fall up" at points in the game. Don't get that twisted, though, cause MetalStorm is far from gimmicky. The control is tight, enemies can be tough, and the level design can lead to some pretty cool moments where you actually have to think before you jump. It's a great game that you can get for around $15 on eBay, and while it isn't on the Wii's Virtual Console yet, it will be soon. I would love to play this on Wii !